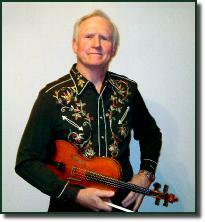 Byron Berline (born July 6, 1944 Caldwell, Kansas) is an American fiddle player. He is widely considered one of the world's preeminent fiddle players and is also one of the most significant figures in contemporary bluegrass music. Berline started playing the fiddle at age five and quickly developed a talent for it. In 1965, he recorded the album Pickin' and Fiddlin' with the Dillards. The same year, he met Bill Monroe at the Newport Folk Festival and was offered a job with the Bluegrass Boys but he turned it down because he had to finish his education. He was graduated from the University of Oklahoma in 1967, with a teaching degree in Physical Education, and joined the Bluegrass Boys shortly after. In September 1967, he was drafted by the U.S. Army. After his discharge, two years later, he joined Dillard & Clark on the album Through the Morning, Through the Night. In 1969, he moved to Southern California. Berline won the National Oldtime Fiddle Contest Championship in 1970 in Weiser, Idaho. He went on to win two more titles. While in California, he joined The Flying Burrito Brothers in 1971, recording two albums, Last of the Red Hot Burritos (Live), and Six Days On the Road: Live in Amsterdam. After the Burritos' breakup, Berline briefly worked with Stephen Stills' band Manassas (which also included several other Burritos' alumni), contributing to several songs on their debut album. He formed the Country Gazette early in 1972, together with Alan Munde, Kenny Werz, and Roger Bush. In 1979, he had a small role as a country musician in the 1979 film, The Rose. Berline collaborated with banjo player John Hickman and guitarist Dan Crary to form the band Berline, Crary, and Hickman; with the addition of Steve Spurgin and John Moore, later, that band became known as California. California was named the International Bluegrass Music Association Instrumental Group of the Year in 1992, 1993, and 1994. In April 1995, Berline moved to Guthrie, Oklahoma to open a fiddle shop called "Double Stop". From the jam sessions on the upper floor, "The Byron Berline Band" was formed. Two years later he founded the annual Oklahoma International Bluegrass Festival." The annual event is among the most acclaimed bluegrass festivals in the United States. Throughout the festival's existence, Berline has brought an array of legendary bluegrass musicians to Guthrie, including Earl Scruggs, Ricky Skaggs, John Hartford, and many others. The OIBF has featured performances by famous international bluegrass artists including the Czech band Druha Trava, the Swiss band The Kruger Brothers, and The Japanese Bluegrass Band. Berline recorded several solo albums, most notably "Fiddle and a Song", which featured guest performances from Earl Scruggs, Bill Monroe, Vince Gill, and Mason Williams. In 1995, the album was nominated for a Grammy Award in the Best Bluegrass Album category, and "Sally Goodin" from the album was nominated in the category Best Country & Western Instrumental Performance. Berline currently owns and operates the Double Stop Fiddle Shop in Guthrie, where Hickman works as luthier. They, along with Jim Fish, Richard Sharp, Greg Burgess and Steve Short, make up The Byron Berline Band. The band travels around the country and to Europe regularly, but continues to perform two concerts a month in Guthrie, entertaining residents of their home town. In his career, Berline has recorded with several of the best known musicians of modern time, including The Rolling Stones, Bob Dylan, Elton John, The Byrds, Earl Scruggs, Dillard & Clark, Willie Nelson, Bill Monroe, Doc Watson, John Denver, Gene Clark, Rod Stewart, The Eagles, The Band, Vince Gill, Gram Parsons, Emmylou Harris, Tammy Wynette, Alabama, Mary Chapin Carpenter, The Dillards, Mason Williams, Bill Wyman, Manhattan Transfer, Joe Diffie, The Doobie Brothers, Lucinda Williams, Mickey Gilley, and many others. His music has also appeared in many television and film soundtracks, including Star Trek, Basic Instinct, Blaze, Back to the Future III, Stay Hungry, and Run Simon Run. Byron Berline was inducted into the National Fiddle Hall of Fame in 2013.